You never had braces as a child, but you should have. Now every time you smile in public, you feel ashamed of your crooked smile. Dr. Ishwinder Saran of LIC Dental Associates is an Invisalign-certified provider in Long Island City. If you qualify, you could have a straight, healthy smile quickly, comfortably and discreetly. The slogan on an old time hair color commercial was “Only her hairdresser knows for sure.” Well, with Invisalign clear aligners, only you and your dentist in Long Island City, Dr. Ishwinder Saran, will know for sure if you are undergoing orthodontic correction. That’s how clear and discreet Invisalign clear aligners are. Custom-made from BPA-free acrylic and fitting snugly over top and bottom teeth, these invisible appliances smoothly and comfortably move teeth into more favorable positions in an average treatment time of one year. Metal or ceramic braces take two to two and a half years or more, depending on the case. Typically, Invisalign patients wear 18 to 30 aligner pairs during the course of their treatment. Each pair is worn for 20 to 22 hours per day and changed out every 2 weeks or so. The patient checks in with Dr. Ishwinder every 4 to 6 weeks for a progress check and to receive additional pairs of aligners. Older teens and adults who are very motivated to enhance their smiles and stay with the treatment plan make great candidates. Through oral exam, photos, and digital X-rays, Dr. Ishwinder determines if an individual can be treated successfully with Invisalign. If so, he sends a detailed plan to the Invisalign lab where a skilled technician individually crafts the aligner pairs. 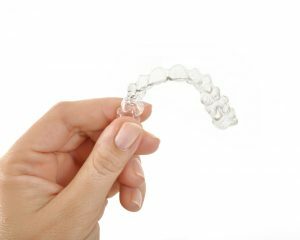 First of all, patients like that no one can really tell they have “braces.” Second, patients enjoy that the aligners are removable; so they can take them out for oral hygiene, meals and for special events such as job interviews or weddings. Finally, patients like the results. After all, if your smile is going to get noticed, it’s great to have it noticed because it’s straight and beautiful. Invisalign smiles increase self-confidence. Contact LIC Dental Associates for a one-on-one orthodontic consultation with Dr. Ishwinder. He can tell you if Invisalign would work for you. This highly trained dentist is very patient-centered and will help you achieve your best and healthiest smile.